Connecting users to the packet-captures most relevant to them has always been a major goal of this project. We have observed that often the most interesting packet-captures on the site are those which are repeatedly visited by our users. 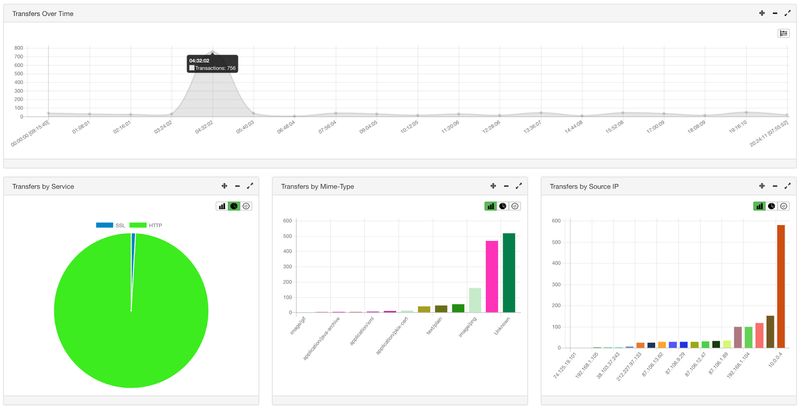 December kicks off with a brand new view to make finding the packet-captures of most interest to our community even easier - Trending Pcaps. 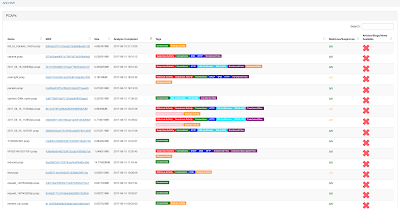 This view displays a list of packet-captures sorted by most viewed, and allows you to see which submissions are the most popular within daily, weekly, monthly, and yearly timeframes. With the recent 2.0 release, the overhead of adding features like this has been greatly reduced, and we have lots of improvements in the pipeline. Back in early February I began working towards consolidating PacketTotal's three major components into the same codebase. The eventual goal being a turnkey virtual appliance that security researchers can install locally on their own network for quick PCAP analysis. Previously, the processing nodes, elastic-cluster, and front-end components could not be installed on the same host. This was mostly because of the way multithreading was implemented in version 1.x processing nodes. For those unfamiliar with the PacketTotal backend, processing nodes are responsible for receiving and replaying packet-captures through Bro and Suricata, parsing the logs, and delivering the results to the elastic-backend, via the Elastic document API. Besides solving issues with multithreading, version 2.0 introduces a much more modular programming interface, which allows new analyzers to be added quickly and with significantly less code. Expect more analysis engines this year! 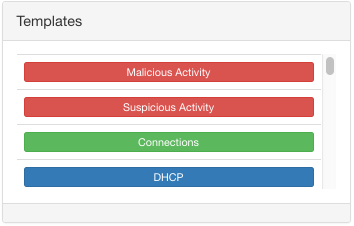 Version 2.0 also introduces the concept of "analysis stages" to track which engine is currently analyzing your PCAP. 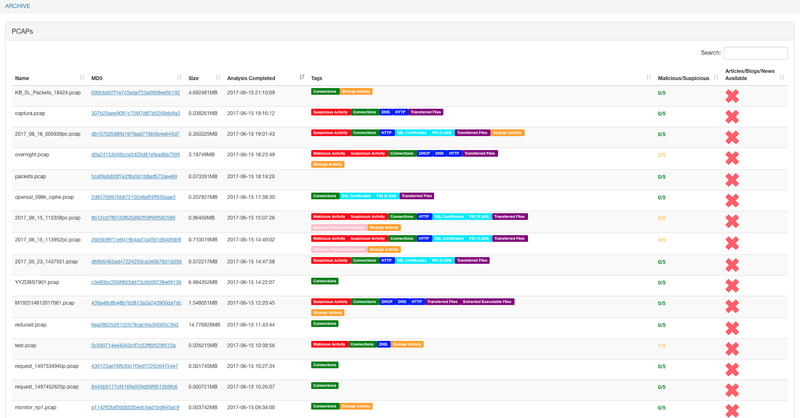 New analysis status page fully implements analysis stages. 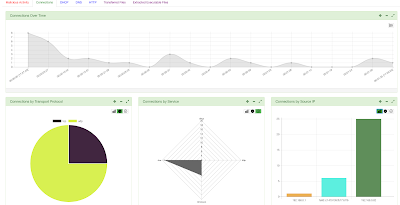 The first of these new analysis engines to be introduced to the processing nodes is the "Intel Analyzer." 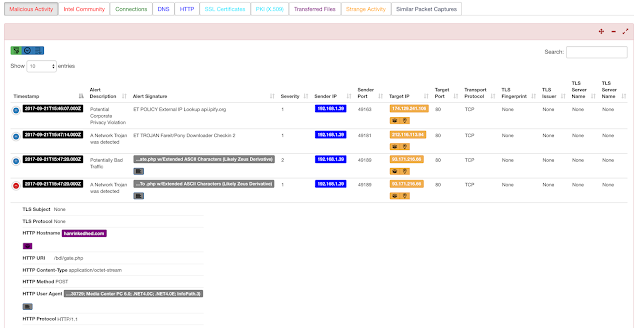 It uses high fidelity indicators found by Suricata and attempts to link them to relevant external content, such as blog posts or write-ups, using that extracted indicator. For example if your packet-capture contains an IP address that is known to be malicious, you may find additional information about that IP in the "Intel Community" tab within the analysis console. August will be primarily focused on improving the front-end and merging the overlapping storage APIs into one codebase. Fixing search is also high on the list as it is still too fickle in my opinion. More updates soon to come, in the mean time give the new engine a try! Anyone who has searched PacketTotal.com has probably experienced frustration with finding relevant results. Up until this point creating specific queries was impossible because the field names displayed in the analysis console are not the same as those used on the backend. So running a search like Target IP: 8.8.8.8 simply would not work because "Target IP" exists as the field "id_resp_h" within ElasticSearch. SearchBuilder bridges this gap, allowing you to build complex Lucene Queries to search our database. For example, you could craft a query to return results of PCAPs containing suspicious executables with the below query. This particular query checks for PCAPs containing at least one Windows executable which contains UPX (common packer) OR TLS (common anti-debugging technique) section. It will also return results if the Alert Signature from Malicious Activity (signature_alerts) contains the keyword .exe. We could craft another signature to look for command and control traffic over IRC. Notice, in this example we use a NOT operator to look for IRC traffic on a non-standard port. The SearchBuilder interface is fairly intuitive. To get started, click the dropdown arrow directly below the search bar located on the search page. Select a template from the templates dialog. This will populate all the fields available for search within the selected template. Due to the way the backend schema is designed you cannot AND fields from multiple templates together. For example combining fields for an HTTP specific URI AND a FTP specific target port will not work, as no one document will contain both of these fields. You could however, OR fields from multiple templates together without an issue. The search terms dialog allows you to click any of the available terms, appending them to your search. By default the equals toggle is selected in the top right. This inserts quote characters around the placeholder, ensuring that only exact matches will be returned. You can toggle this option to use contains, which will insert asterisks on both sides of the placeholder. Toggling contains will look for any PCAP which has a field containing the text between the asterisks. 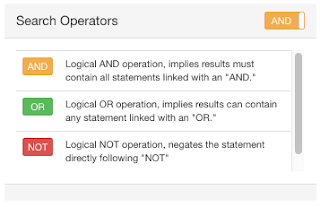 Finally, the search operators dialog provides a quick way of adding aggregation and negation logic into your query. By default, when you select a new term, it will be AND'd with the previous term. This again can be toggled to use the OR operator instead. SearchBuilder is yet another tool to improve the intelligence being gathered from this tool. Please feel free to email me with improvements or suggestions.